In honor of the Couples Date Night Challenge I’m hosting with Goodwill Akron next month, here’s a picture of my husband and me in thrifted outfits! 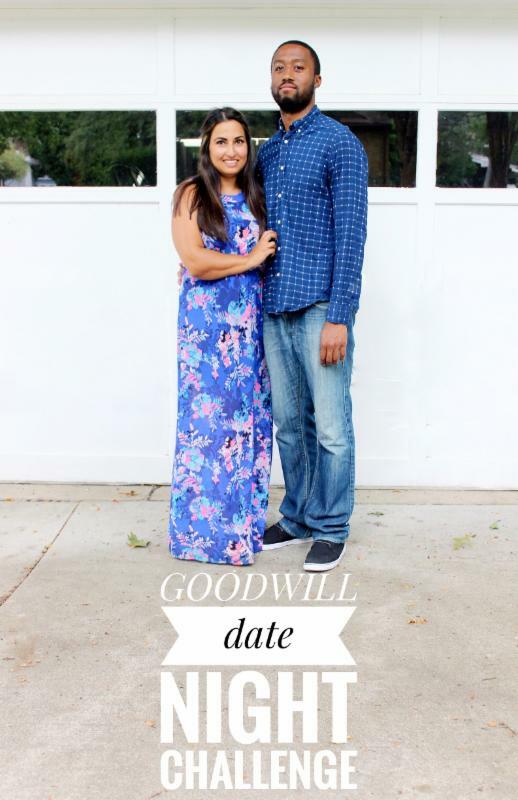 I’m sure many of you have seen the viral post of the couple who found funny outfits at Goodwill for date night. Because Goodwill and I believe that thrifting is more than ugly 80s prom dresses, our take is to encourage you find real, fashionable outfits for you and your partner. Think of Supermarket Sweep, but with thrifting! You have 30 minutes and $20 each to style two head to toe secondhand outfits for you and your partner. In exchange for the outfit, you give us permission to share your looks on the blog and Dina’s Days / Goodwill social media pages. Three couples will be chosen as winners by a panel of thrifting experts. Check out the prizes, they are pretty, pretty good. Never thrifted before? By all means, please join us! We will share tips and tricks to help steer you in the right direction. Also, be sure to browse around here on the blog for hundreds of posts on thrift shopping. And PS) your partner doesn’t have to be a romantic one, mom / daughter / son, girlfriends, sisters, brothers are all welcome! We just ask that you partner up.